Your Water. Your Money. Your City. Opportunities to implement green sidewalks are created when sidewalks are constructed to improve streets, as part of the reconstruction of utility infrastructure or to incorporate ADA requirements. 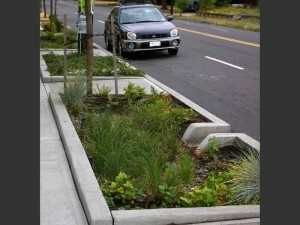 Green infrastructure technologies applicable for sidewalks include curb extensions, sidewalk planters, tree trenches and porous pavements. 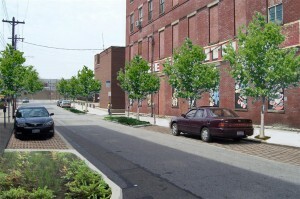 A number of Curbside rain gardens have popped up surrounding other green infrastructure projects throughout Lancaster City. They often extend from the curb or intersection, serving to both capture stormwater, while also slowing traffic and making these areas safer for pedestrians. These images, of permeable concrete, are from Two Dudes Painting Company who completed their Green Infrastructure project in the fall of 2013. For more images click here. Planning a renovation or construction project?